Cleo & Ant Done, originally uploaded by EeyoreknitsinME. 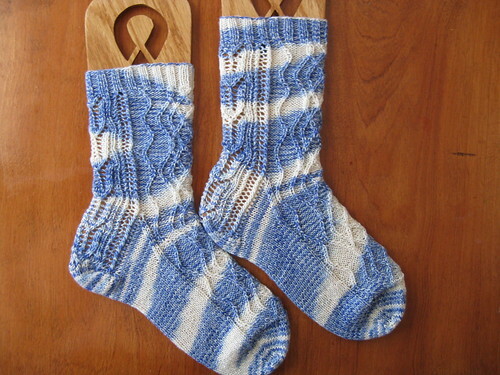 This is the second pair of self-designed socks that I've done. My daughter was doing a report on Cleopatra, I had this Tofutsies from SWTC that reminded me of swirling water and presto! Cleo & Ant was born. 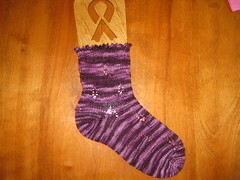 The front of the sock is a modified Cleopatra cable, flanked by her egyptian asps. The back is Arrowhead lace bordered by identical ladders. The Arrowhead lace is continued through the heel flap.